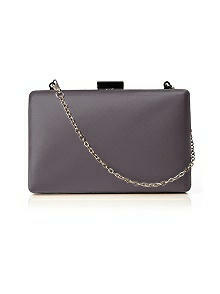 Elegant matte satin hard case pillbox clutch has optional 12" chain. Classic shape and style makes it an ideal accessory for evenings out. Ships with pale gray print dust cover. 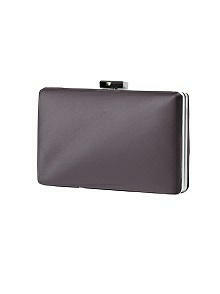 Silver snap closure with small interior pocket. Approx dimensions: 4.5" H x 6" L x 1.75" W.